Worcester Junior 28i Combi Boiler Fault. This combination boiler would not fire for domestic hot water after work to mains cold water supply pipework in street. During repair to the street cold water main, grit entered the domestic water main. The customer had already removed significant amounts of grit from the domestic main cold stopcock in the house but called us when the combi boiler failed to fire up to produce hot tap water. The boiler fired normally for central heating but not for hot tap water though flow rate of water through the hot tap was OK. Given the earlier problems with grit in the system we were looking for a flow switch problem. 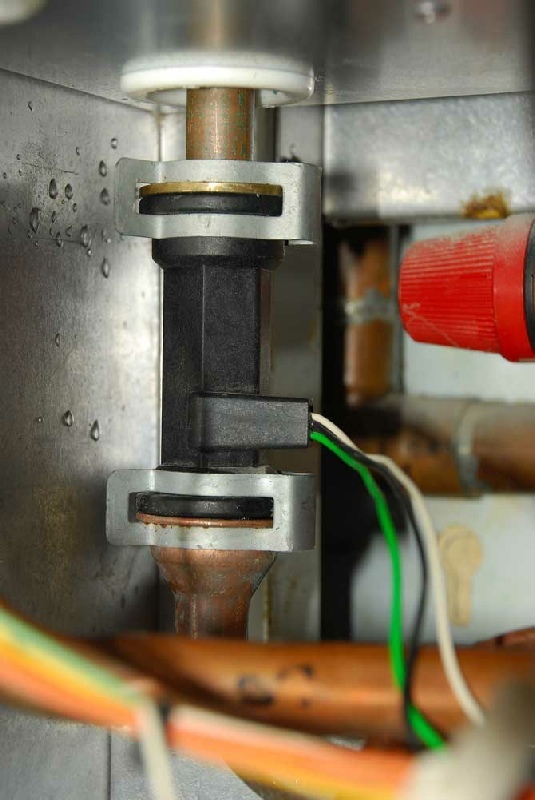 We shut off the mains cold water into the boiler and shut off the electrical power to the boiler. After disconnecting the 3 wire connection plug and the two grey spring clips in the photo the flow turbine was easy to remove. We removed the copper pipe connecting from the boiler cold inlet valve to the bottom of the flow turbine as this made it easier. There is a mesh water filter/flow restrictor in the bottom flow turbine. This had trapped a few particles of grit but nowhere near enough to limit the flow. We removed the filter and blew through the turbine but the turbine did not spin. Tapping the flow turbine sharply a few times dislodged some very small grit particles and freed the turbine so that it would spin when we blew hard through either end. You can't see it spin but you can hear it. Clearly the tolerances in the flow turbine are fine enough to be troubled by particles small enough to pass through the mesh filter. With the system re-assembled the boiler worked fine for both heating and hot water.